HEAl 9th graders take an introductory course for HEAL (Health & Environmental health Academy of Learning) that covers the foundations of health care and environmental health science, health care terminology, personal traits and personal healthy lifestyle planning, health care professionalism, and health care and environmental health science career options. It includes the development of professional soft skills and study habits for academic success. 9th grade students visit simulation labs. HEAL students work with industry partners on a regular basis. 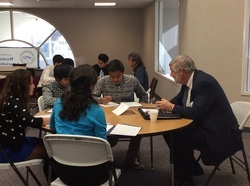 9th graders interview former DRMC Human Resources Director, Hank Hudson on Professional Interview Day. ​Our sophomores become experts on the issues regarding the Salton Sea and have been asked to present to several groups throughout the community, including the Indio Chamber Breakfast.